Unavailable. Discontinued. Kit is Available in Orange Bag Only. See Below. 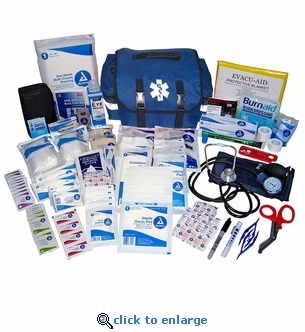 This EMT style first responder medical kit in a navy blue bag was designed for trained medical professionals, with kit contents validated by EMTs, firefighters and nurses. It comes fully stocked with an extensive assortment of trauma and first aid supplies for use in a wide range of emergency situations. The "Easy Access" heavy duty responder bag has multiple pockets to help keep supplies organized, and includes extra space for any additional EMS, EMT or paramedic supplies. Exceeds ANSI Standard Z308.1.2009 (workplace minimum first aid supplies category). Weight with Contents: 6.5 lbs. 2 Abdominal Pads Sterile 8" x 7-1/2"
4 Abdominal Pads Sterile 5" x 9"
2 Triangular Bandages w/ Clips 40"
2 Bloodstopping Compression Bandage 9" x 5-1/2"
5 Fabric X-Large Knee Bandage 2" x 4-1/2"
20 Fabric Bandage 1" x 3"
1 Emergency Mylar Blanket 54" x 80"
2 Tongue Depressors Sterile 6"
5 Cotton Tip Applicators 3"
* Items expire 2 years from the date of manufacture. ** Items expire 5 years from the date of manufacture.